The research on microbiota-based approach for predicting early childhood caries at QIBEBT (Cell Host & Microbe, 2015, 18, 296) was highlighted by The Scientist after a phone interview with Prof. XU Jian, coauthor of this study. When the human body changes as a result of disease, age, or other factors, site-specific microbiomes are also altered. Now, researchers report that changes in the oral microbial community can be used to predict the onset of dental caries in young children months before clinical signs of disease appear. The results, published today (September 9) in Cell Host & Microbe, suggest that changes to the oral microbiome can be used as an indicator of disease risk for some conditions. 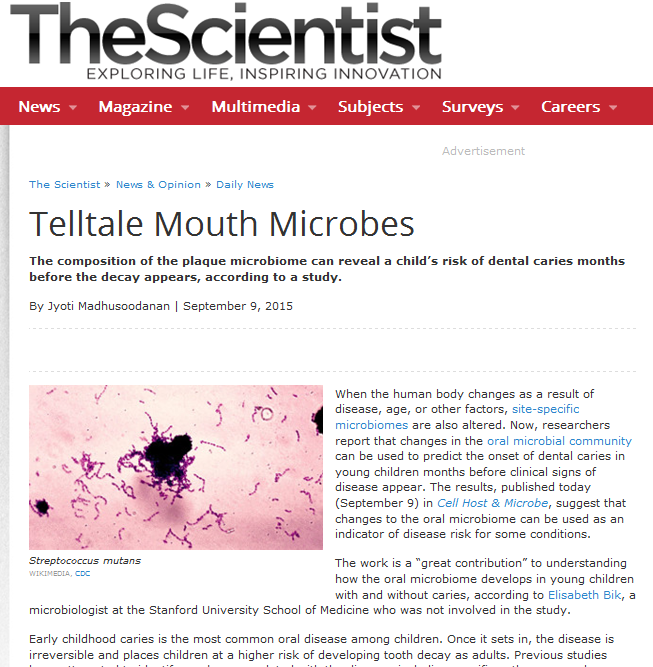 The work is a “great contribution” to understanding how the oral microbiome develops in young children with and without caries, according to Elisabeth Bik, a microbiologist at the Stanford University School of Medicine who was not involved in the study. Xu and his colleagues tracked how the oral microbiome developed in the plaque and saliva of 50 four-year-olds. Over a period of two years, the researchers tracked the kids’ oral microbes by sampling them every six months. The children were all healthy, attended the same school, followed similar meal plans, and brushed their teeth twice a day. When starting out, the children were divided into three groups: kids with no caries were considered healthy, those with one to six teeth affected by caries had early disease, and those with more than six affected teeth were classified as having severe caries. Throughout the two-year period, the researchers assessed how different factors influenced the children’s oral microbiome. They found that the top three factors influencing the microbiome composition were a child’s age, followed by the severity of his or her caries, and lastly, individual differences amongst the preschoolers. “The development of oral microbiota in children is correlated to age, so for a particular age, the oral microbiota can serve as an indicator of how old the child is,” Xu told The Scientist. Compared to healthy children who did not develop caries during the study, kids with early caries that worsened over time had a less-mature microbial community, suggesting that caries could slow the normal aging process of the microbiome. Surprisingly, the distribution of Streptococcus mutans, a common caries-linked pathogen, was not strikingly different across the groups, Bik pointed out. The most profound change in the kids’ plaque microbiomes, however, appeared to occur right before early caries set in. Based on their observations, the researchers developed a predictive model that could pinpoint which caries-free study participants would develop the disease, with more than 80 percent accuracy. In future work, Xu and his colleagues aim to extend the study to preschoolers in other countries, and pinpoint the timeframe when a shift in the microbiome signals the onset of oral disease. F. Teng et al., “Prediction of early childhood caries via spatial-temporal variations of oral microbiota,” Cell Host & Microbe, doi:10.1016/j.chom.2015.08.005, 2015.